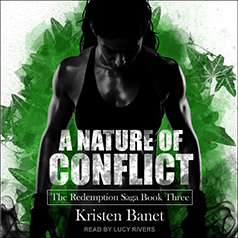 Kristen Banet presents the third book in the Redemption Saga series. Contains mature themes. Sawyer Matthews is a retired and presumed-dead assassin. Ripped from her life of shadows and secrets, she's decided to gamble it all and accept a new chapter in her life—one that may lead to a brighter future. With her first case over and budding relationships with some of her teammates, Sawyer finds herself feeling more secure. Sawyer's found a place on the team, and wants to keep it, no matter the struggles that come from it. It should have been a standard, mundane trip to New York, and the base of operations for the IMPO and the WMC. Conflict ensues when political intrigue, hot tempers, and old grudges land the team in trouble with those who would see Sawyer fail. The team will need to fight to stay together.